Computers require basic maintenance tasks to ensure they run smoothly and do not suffer performance degradation. One of the most basic tasks you can perform to speed up a sluggish PC is defragging the hard drive. While this may sound like a complicated task, it is relatively simple and can result in drastic speed improvements. Every time you use your computer, data is being written and rewritten to your PC’s hard drive. As time passes, this results in the data on your hard drive being fragmented or stored in un-optimized locations. A simple way to visualize this process is to think of a jigsaw puzzle. You start with a puzzle that is completely assembled, but over time pieces of the puzzle are taken out so they can be examined and used. However, once they are examined, the pieces aren’t put back where they were taken from. Instead, they are tossed into a pile with other puzzle pieces. As the drive is used more and more, the pile grows and more of the puzzle is missing. This is a process called fragmentation. When your drive becomes fragmented, it often drastically slows down the performance of your pc because each time it needs to access data it has to search across a wide area of the disk to find the pieces of data that goes together. To fix fragmentation, a process called drive defragmentation should be performed periodically. Basically, the defragmentation process will take that pile of puzzle pieces and fit them back into the puzzle where they belong. Once the pieces are back where they belong, performance often drastically improves and your PC runs noticeably better. On a Windows computer, the defragmentation process is completely automated. You run the defrag tool in Windows, and then the operating system does all of the work for you. However, during the process it is usually best if you do not use your PC for other tasks. The process works quicker if data is not being accessed during it. On a larger hard drive, the process can take a longer period of time. For very large drives, it can take hours to run, so it is often best to begin the defragmentation at night and leave it running without interference. Starting with Windows Vista, newer versions of Windows automatically perform defragmentation tasks when they are needed. For people who use Vista or Windows 7, you will not need to run the defragmentation tool manually. The tool is still available within the operating system, but you do not need to manually perform this task on a regular basis. For those using Windows XP or prior, the defragmentation tool is located within the computer properties under the tool tab. To access the tool, you would right click on “My Computer” and then click on properties. In the properties screen, you will then select the “Tools” tab. On the tools tab, there is a button labeled “Defragment Now.” Clicking this button will begin the defragmentation process. There is no exact interval that this type of maintenance should be performed at. However, many people choose to defragment their drives every few months even if their performance has not slowed. By defragging the drive at a regular interval, you can avoid performance slowdowns, and it will make the defragmentation process quicker. If the drive is defragmented often, there is less work to be done during the process because there are less “puzzle pieces” in the pile to reassemble. Disk defragmentation is part of regular maintenance that results in a healthier computer. 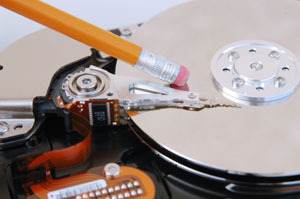 By regularly defragmenting your hard drive, you can prevent sluggish performance and ensure your computer operates at optimum efficiency. The process is fully automated and easy to begin, so you should not hesitate to perform this maintenance on your PC.